Looking for Delta Force Paintball deals? If you are shopping around for a great paintball deal you might be tempted to choose the cheapest paintball provider on offer. It’s your choice of course, but opting for a cheap paintball provider can often mean opting for a low quality paintball experience. At Delta Force Paintball, you can enjoy a premium paintballing experience at an affordable price. This includes access to movie set quality game zones, brought to life using real props from blockbuster Hollywood movies. You also benefit from state-of-the-art 5-star† safety equipment, such as helmets that completely protect the head and combat suits with padded collars to cover your neck. 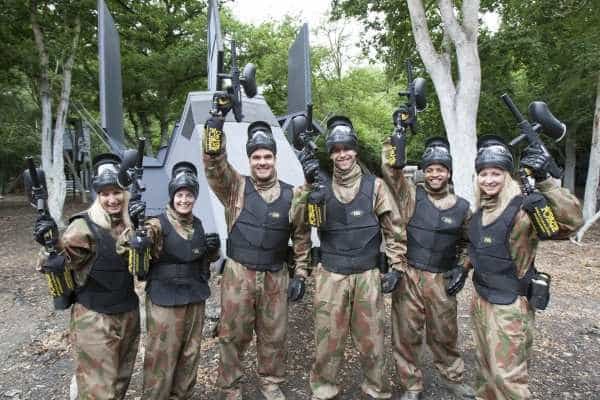 Please feel free to visit our paintball game zones and paintball equipment pages for more information, or scroll down for details of our paintballing deals. Everyone loves a great paintball deal! Parents are often surprised to hear that kids as young as 8 have their very own version of paintballing at Delta Force. This game, known as MiniBall, is exclusive to 8-10 year olds and features less powerful paintball guns paired with a shorter day of paintball. A half day of mini paintballing, including 6 games and 300 paintballs is just £29.99 per child. Visit our MiniBall price page for more information about what you can expect on a mini paintballing experience day. Often referred to as Juniors or Young Guns, this age group takes to paintball like ducks to water. For that reason we have put together a selection of inclusive paintballing packages with prices starting from £14.99 per person for entrance, equipment hire and 100 paintballs. Visit the Junior Paintball price page for details about our other great value inclusive paintball packages. We offer a £10 saving on 1000 paintballs bought in bulk. This works out at £6.99 per 100, instead of the normal price of £7.99 per 100 in smaller quantities. This is a great value paintball deal, especially when considering that the average player uses between 400-600 paintballs on the day. There is nothing worse than having to severely ration your paintballs, or worse yet, running out of paintballs in the heat of a battle. For more information about this great paintball deal and other equipment prices, please contact our bookings team by clicking here . The standard issue paintball gun is a tried and tested weapon, more than capable of holding its own in the heat of battle. However if you are looking for an added edge over your opponents, the M16 upgrade gun is well worth checking out. This semi-automatic rifle looks and feels the part and offers better accuracy than the standard paintball guns. The best news is that its available from only £10 for the whole day – that’s about 83p per game! For more information about the M16 paintball gun please visit the M16 upgrade paintball gun page. Interested in exclusive paintballing deals and discounts? We like to reward our loyal customers with exclusive paintball deals and promotions. The only way to receive these discounts is by subscribing to our mailing list. Once signed up you will be on the list to receive the next Delta Force Paintball newsletter. †As awarded by the UKPBA. The largest paintball governing body in the UK. Visit the UKPBA website for details.